April 2nd 2011 is going to be a memorable day in every Indian's life, Yes, This is the day, our team has won the WORLD CUP. Me and Savi ,we were in Saras house to watch the finals , o man, what a match, what a perfect way to reach the target with a six ( 6 ....) Seriously, it was a nail biting experience and we were on high when Dhoni hit the last ball with a six.. Thanks to Almighty for making this happen.. Really , the winning moment, had brought tears in everyone's eye... Chak De India..
Peel the skin of the plantain and half boil along with turmeric powder , salt and oil. Meanwhile , grind the items given to a fine paste adding very little water. Heat a pan adding oil and pour in the ground paste. Stir the paste over medium flame and arrange the half boiled slices on the top of the masala. Slow cook the plantain for 3 minutes on one side / until it turns golden brown and flip to the next side. Again slow cook the plantain till it turns crispy and cooked and the raw smell disappears. Seperately heat another pan adding oil and do the tempering in the folllowing order -- hing , mustard seeds, urad dal and curry leaves. Add the seasoning masala's on the plantain and combine well. Serve with rice. Adding flour in the masala is totally optional. I like adding besan flour , U may add rice / Corn flour to make the fry extra crsipy. Fries look amazing and to add the marvelous win of our team. Ooo what a perfect side dish for rice:-) Love the texture of it!! Must try...Bookmarked!! Yea, enjoyed tha match to the core...Chak De India..Plantain fry looks simply fabulous,my fav with curd rice..
yummy nice dish good with rice. What an excellent match and a great win !! Plantain fry looks so crispy and yummy !! A BIG YAYYY- for the men in blue!!!! 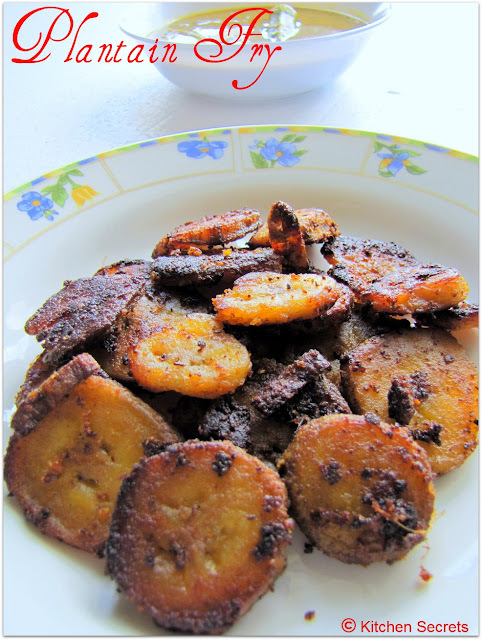 Plantain fry looks spicy n crispy..
That fry looks awesome crispy and delicious. looks yummy, wanna grab some.. Delicious and easy to cook!! Plantain fry is one of my favs!! i always think of doing plantain in different way...but never tried!! surely try it! !looks crispy n yummy!perfect with curd n rasam rice! Delicious and crispy. Plantain fry is inviting. ooh.. looks so good.. i am huge fan of vazhakai.. just superb..